The latest phone from Vivo, the V15 Pro’s full specs and price has been leaked online. And according to the latest leak we see that most of the phone’s specs are similar to what reports were stating about the phone earlier. According to this leak the V15 Pro will be sporting a 6.39-inch Super AMOLED display that will come with full HD+ resolution. The screen won’t have a notch on it and unlike 2018 that saw the rise of notched phone displays, 2019 will see the coming of new notch-less phones. And the Vivo V15 Pro is no exception, its display is advertised as ‘Ultra FullView Display’. According to the Geekbench listing, Vivo V15 Pro will have a Snapdragon 675 SoC under its hood. And with the SD 675, it could be the first phone with that processor to be launched in India. Also, the phone will have 6GB RAM and it might have an internal storage of 128GB. It will also have an microSD card slot for additional storage. The V15 Pro will have a 32MP front camera and will have a triple rear camera setup with a humongous 48MP primary sensor paired with an 8MP and 5MP sensors. This will come with AI support for clicking pictures. According to rumours, it could have Samsung’s ISOCELL GM1 as its primary camera sensor. This is already seen on other smartphones like the Samsung Galaxy A8, Redmi Note 7 and Huawei Nove 4. 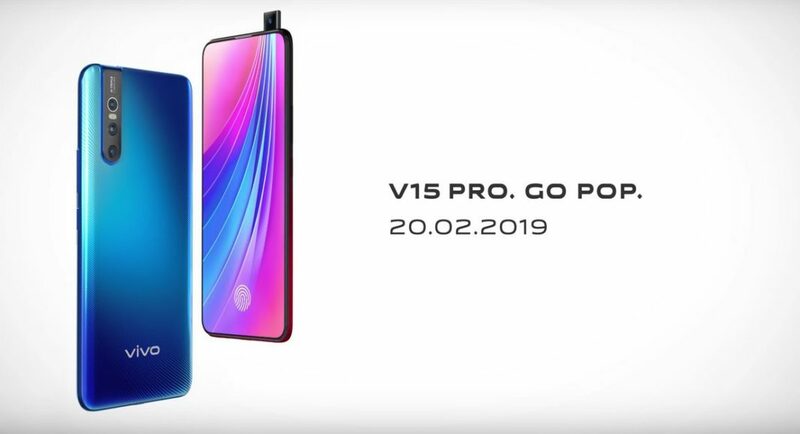 The Vivo V15 Pro is the successor of the V11 Pro which had a 3,400mAh battery, but the V15 Pro is expected to have a larger battery than its predecessor. If rumours are to be believed it will sport a 3,700mAh non-removeable battery. It is also expected to be equipped with support for dual-engine fast charging. Talking about the price the leaks claim that the Vivo V15 Pro will be priced somewhere between $350 (Rs 25,000) and $460 (Rs 33,000). While its predecessor the V11 Pro with 6GB RAM + 64GB storage is currently priced at Rs 23,990. Vivo might launch the Vivo V15 Pro alongside Vivo V15. But there are no reports or information available on the specs of the V15. It is estimated that it could be priced between $280 (Rs 20,000) and $350 (Rs 25,000). These phones are to be launched in India on 20th February this year, but their pre-orders might start as early as 15th February, 2019.